Festive fun & mobile learning with the 12 Apps of Christmas! As the festive season approaches, there’s another opportunity to take part in a revised 12 Apps of Christmas activity – a free, short, online Continuing Professional Development course in which an app is released each day for the first 12 weekdays of December. Log in for 10 minutes a day and get a quick outline of different ways that you can integrate particular apps into teaching and learning. There are several versions of this initiative being run by various institutions. UoR Senior Research Fellow Alice Mauchline and colleagues in the Agriculture Department have written a case study on an app (top secret until the big reveal!) for the course produced by the Dublin Institute of Technology. Or why not enrol on the award-winning course from Regents’ University, London? Enrol now and get ‘appy for Christmas! Not sure what an app is? Click here to find out more. 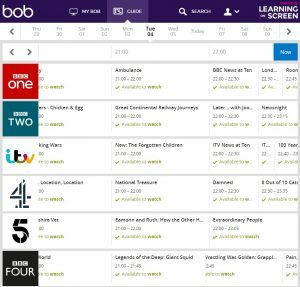 Our newest e-resource is Box of Broadcasts (BoB) – BoB is a resource that allows you to record and view TV and radio programmes from over 65 free-to-air channels. Also available is an archive of over 2 million programmes from the 1990s to the present day – ready to watch. Includes content from; BBC TV and radio, ITV, Channel 4, Film4, some foreign language channels, the BBC Shakespeare Archive and lots more! Check the full list of available channels. We understand that BoB will shortly be introducing an embed function, and when that is live we’ll update our guide accordingly. If you plan to use BoB to enhance your teaching we’d love to hear about it! Contact Natalie Guest with your ideas.